I'm happy to report that Audrey's first day of Kindergarten was a rousing success...She met a new friend (Spencer!) and just generally had a blast + she's already declared her undying love for her teacher Mrs. Akins. My Kindergarten teacher was named (are you ready for this) Miss Kitty Bankston. I LOVED her...words can not describe. Day-one of school a success, Audrey and I looked through some of the photos I have archived last night, so she could "curate" today's Loving post. Herewith her picks. (Can you tell she's obsessed with purple and pink?) Enjoy! She loves this wallpaper... 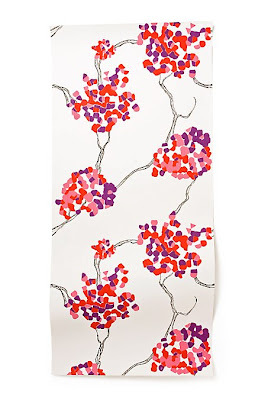 I love it too -- maybe for behind the wall behind the bed in Millie's room? Millie making a mess... This cracked Audrey up -- she loves it when her sister causes any sort of mayhem. She was psyched to see this in my photo folder... It's her all time favorite book, and the Lauren Child version is amazingly cool. Audrey girl, you have got an artist eye. So glad that your first day of school went so well. Is Spencer cute?? Lauren Child is great! Check out Clarice Bean and Guess Who's Babysitting? They're both great! Her picks are perfect. I would love that cake right about now. Oh and I believe we have the same dress, I also have another in green. Audrey is one very cool little girl! what great picks. 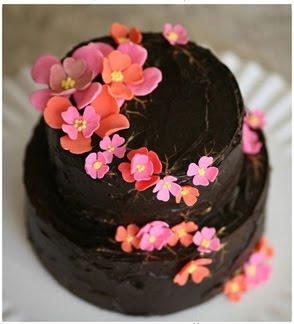 I love the wallpaper and the chocolate cake with the delicate little pink flowers - it would be hard to cut into! tomorrow is my little boy's first day in pre-school. i don't know what to expect but i feel the anxiety. i love it when they make new friends... so sweet! How wonderful that her first day of school was such a smashing success. You must be very proud! I'm so happy for her! BEfore long you will be organizing her social calendar. Audrey has excellent taste, just like her mama. The wallpaper is the most sophisticated pink-and-purple variety I've ever seen! Have you checked out Lauren Child's newly released "Goldilocks"? It's in the same spirit as P. & Pea. That book is our all-time favorite read for bedtime, and i can't get enough of the artwork! Hooray for Audrey and her first day, can't get over her teacher's name, gotta love that. Congratulations Audrey on your first day at kindergarten and I love your beautiful picks! What a sweet idea you two! Your daughter is incredibly cute! Her love for pinks and purples and flowers is very very adorable! What a lovely post! She clearly has a storng sense of style! Congrats on the first day! I think if I were going to be a kindergarten teacher, I'd have to change my name to Kitty Bankston. love love love this post and what a perfectly curated selection of goodies!! great minds is right! what a sweetheart. maybe when Eva learns to read and write they can be penpals! can't wait to see what sounds like one killer birthday bash. queen of hearts, totally fab. i like the flower cake!! oh. my. 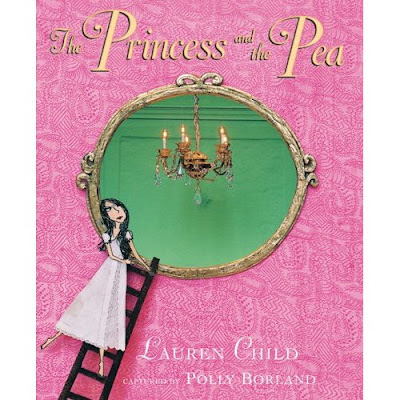 Lauren Child did a version of Princessa and the Pea? Ohhhh! I can't wait to buy this for my little friend, Catherine.